Laxmi Vilas Palace was the local Rajah's Hunting Lodge. 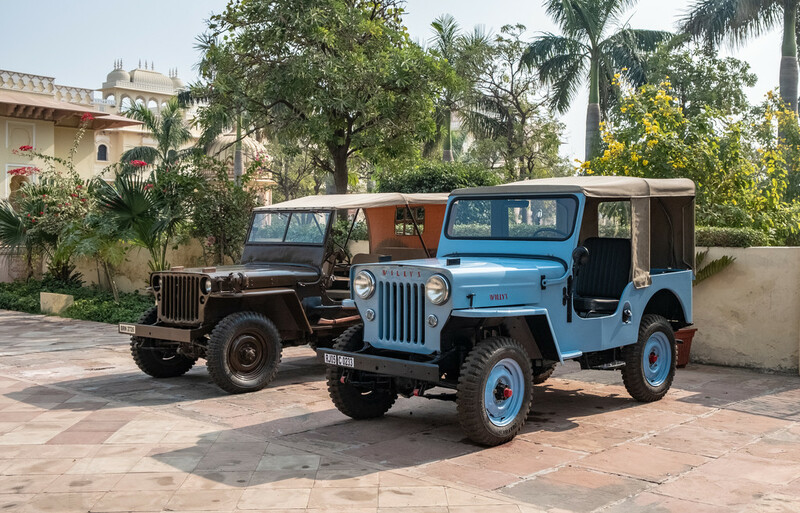 These beautifully preserved jeeps were, presumably, used for the hunt. Most of us wanted a drive, but no chance of that happening. Classic machines- I like that blue one! @olivetreeann There's a long queue of people wanting that one. @golftragic LOL I don't want it (I'd probably destroy the gears if I had to drive it!) I just like the color! Bump your a$$-mobiles, IMO. I do admit that my Dad had one after WWII but my Mom made his sell it before I was born. @joysabin Absolutely right Joy, but still lusted after. How cool is that - and they are in such good condition! @robz Oh yeah, lots of people to keep them that way, I guess. @gilbertwood I'd've loved to have a drive. @fbailey Me too!!! And most of our group too. @merrelyn Sure are, lots of people to keep them that way.